Automotive brand Subaru has taken to the road in North America with its Winterfest Lifestyle tour, aiming to bring together 'winter warriors' for an immersive, winter-themed experience. 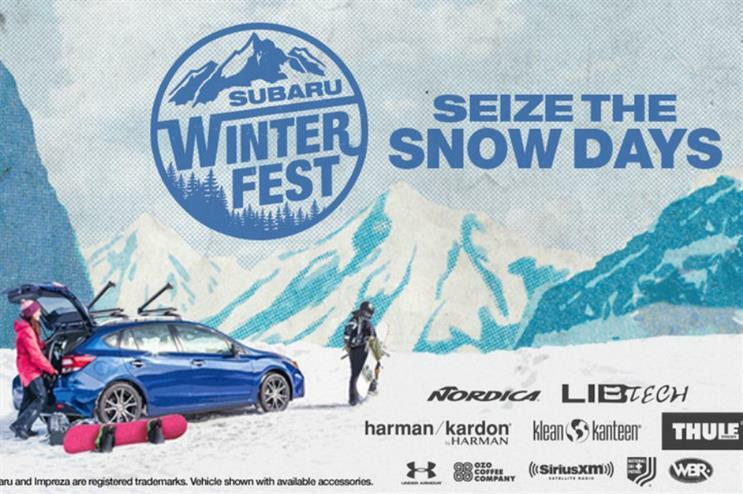 The Subaru #SeizeTheSnowDays tour will stop at 15 destinations across 12 different ski resorts in the US, and invites skiers, snowboarders and winter enthusiasts to join in and enjoy live music, food and beverages, daily giveaways and gear demonstrations. The events will feature live music from acoustic rock, indie-rock and bluegrass bands, and guests will also be able to enjoy DJ sets. In addition, each tour stop will offer complimentary s'mores, craft OZO coffee and hot chocolate. Attendees will also be encouraged to participate in giveaways and try the latest gear from partners Nordica, Lib Tech, Thule, Klean Kanteen and Under Armour. Subaru is also teaming up with the National Ski Patrol to help create a scholarship fund that sends patrollers and their dogs to Wasatch Backcountry Rescue's avalanche dog training school. Throughout the WinterFest tour, Subaru will donate $1 to the scholarship fund for every Subaru information form received. At specific WinterFest events, patrollers will also be staging avalanche rescue demonstrations with their dogs. Alan Bethke, senior vice president of marketing at Subaru of America, said: "Subaru has long taken pride in being a brand to facilitate your passions, including winter sports, and our all-wheel-drive vehicles help to power skiers and snowboarders to countless winter adventures. We are excited to take Subaru WinterFest on the road to resorts around the country to connect those that share our passion for all things winter." In November, Jaguar unveiled its electric model with a virtual reality experience. Last month, the House of Rolls Royce launched a series of events and short films.